Chief Minister B S Yeddyurappa on Friday promised to give a big boost to Bangalore by earmarking a whopping Rs 5,000 crore for city infrastructure in 2010-11. His budget proposals come at a time when the Bruhat Bengaluru Mahanagara Palike (BBMP) is preparing for elections. Muniyappa recently said the Railways would consider starting a local train service in Bangalore, on the lines of the one in Mumbai, if the State government “comes up with a proposal.” If implemented, the city traffic condition may ease considerably. Infrastructure projects planned to be taken up in 2010-11 in the city include improvement of roads, footpaths, construction of bridges and underpasses (at a cost of Rs 3,000 crore), multi-level parking lots, rejuvenation of 25 tanks and improvement of 10 key traffic routes (at a cost of Rs 1,200 crore through the BDA) and providing drinking water and sanitation facilities in the newly added areas of BBMP (at a cost of Rs 425 crore through the BWSSB). The BWSSB will also take up a Rs 100-crore project to replace defective water and drainage pipes in the city. 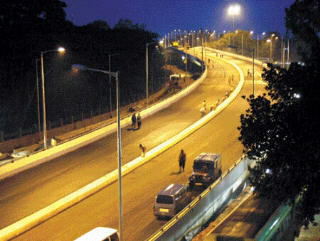 The chief minister has allocated Rs 600 crore for the “Namma Metro project” in the coming fiscal. A total of Rs 18,872 crore will be spent, in the coming three years, on various programmes, including metro rail and mono rail projects, in Bangalore. For the development of Bangalore city, the pride of the nation, approximately Rs 6,000 crore has been spent in the last two years,” the chief minister said in the budget. Emphasis has been given to the development of other towns as well. A new scheme called “Mukhyamanthri Nagarothana Yojane”—covering 7 city corporations, 44 CMCs, 94 TMCs, and 68 TPs—has been proposed at a cost of Rs 600 crore. The scheme envisages providing drinking water and sanitation facilities and improving roads. A separate allocation of Rs 304 crore has been made to expand drinking water facilities in 120 towns of the State. Besides, the 24/7 water supply scheme—already implemented in Gulbarga, Hubli and Belgaum on a pilot basis—will be extended to 16 more towns in the State. A sum of Rs 25 crore has been allotted to the newly formed Yadgir district for improving its infrastructure. This apart, Rs 600 crore has been allocated for cost-sharing railway projects in the State. In all, the chief minister earmarked Rs 5,883 crore for the urban development in the State. All single-lane State Highways will be upgraded into double-lane roads in the next three years at a cost of Rs 3,000 crore. An allocation of Rs 250 crore has been made for the scheme this year. Besides, Rs 737 crore has been provided for upgrading district roads. A special package of Rs 25 crore has been announced for road development in Kodagu district. Yeddyurappa announced plans to develop the port at Tadari into 34 million tonne capacity and the one at Haldipur into 8 lakh tonne capacity with private participation. Interestingly, the Budget is silent on the proposed airstrips. In his 2009-10 budget, he had proposed to take up development of 11 airstrips at a cost of Rs 4 crore each. But the project failed to take off as the allocation was meagre. Improvement of roads, footpath, construction of bridges at the cost of Rs 3,000 crore. Construction of multi-level parking lots, rejuvenation of 25 tanks and improvement of 10 key traffic routes at the cost of Rs 1,200 crore. Providing drinking water and sanitation facilities in the newly added areas of BBMP at the cost of Rs 425 crore. Rs 100 crore project to replace defective water and drainage pipes in old areas. Rs 600 allocation for Namma Metro.